Few defensive football players get any significant love or exposure in the hobby. Ray Lewis is one of those exceptions. The combination of dominant player, a legacy of winning and lots of charisma made Ray Lewis rookie cards and memorabilia a favorite with collectors. 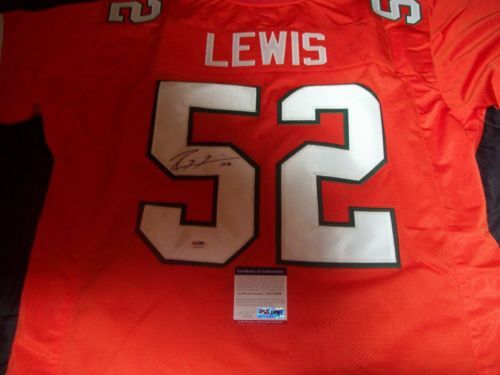 Lewis spent his entire professional career with the Baltimore Ravens. 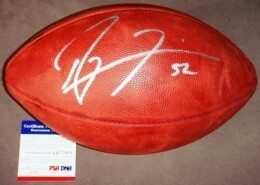 Draft by the team in the first round of the 1996 draft, he quickly became one of the NFL's dominant linebackers. He helped lead the Ravens to victory at Super Bowl XXXV and was named the game's MVP. That same year, he was awarded the league's Defensive Player of the Year. 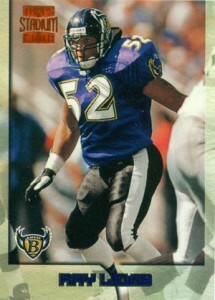 Shop for Ray Lewis cards on eBay. Collectors have less than ten Ray Lewis rookie cards to track down. Most come from brands largely forgotten by the hobby. For example, both of the flagship 1996 Topps Football and 1996 Upper Deck Football sets left the linebacker off their final checklists. Values for Ray Lewis cards and memorabilia should hold well into his retirement as he's staying in the spotlight with a second career in broadcasting. He also hasn't signed a ton of cards, making his certified autographs strong sellers. Moving beyond his rookie season, check out some of the very best Ray Lewis cards of all-time. 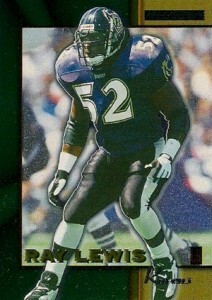 The 1996 Bowman's Best Football Ray Lewis is easily his most popular rookie card. Featuring the brand's trademark chromium look, it has a busy look with lots going on. Refractor and Atomic Refractor parallels represent the ultimate chase for early Ray Lewis cards. 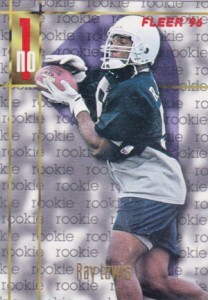 A nice low-end option, the 1996 Collector's Choice Ray Lewis rookie card shouldn't set collectors back too much. While the design is distinct to the era, it still holds up well today. The biggest knock against it is the lack of pro uniform in the photo. 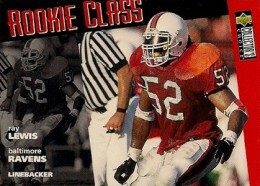 Perhaps the less that is said about the 1996 Fleer Ray Lewis rookie, the better. The biggest plus for this unattractive card is that it comes from a brand with a lot of hobby tradition. The 1996 Pro Line Intense Ray Lewis lives up to its name. 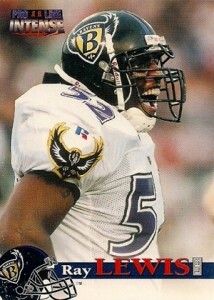 If you're a fan of great photography, this is by far the most distinct of the first-year Ray Lewis cards. It's about average value compared to his other rookies. If you're a fan of foil cards, 1996 Score Board Lasers is the way to go. While the look is distinct, the lack of brand legacy hurts its potential. The same can be said for many of the first Ray Lewis cards. 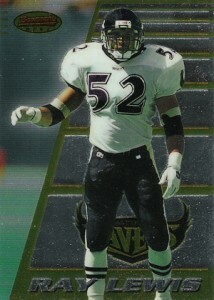 A full-bleed design and solid photo work in the favor of the 1996 SkyBox Impact Rookies Ray Lewis rookie card. From a value perspective, it's a little better than average. 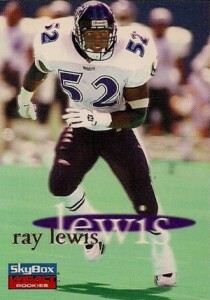 Next to Bowman's Best, the second-best Ray Lewis rookie card is from 1996 Stadium Club Football. A short print, the Series 2 card has a solid in-game shot. The side and bottom borders make it a little busy, particularly for a Stadium Club set, but it's not terrible. 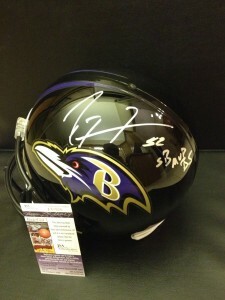 Ray Lewis GOLD ZONE SP 50 with free shipping !! 1998 NFL Players Party set (11) w EMMITT SMITH, SHANNON SHARPE, RAY LEWIS Rare! Below you will find an example of what Ray Lewis' authentic signature looks like. This can be used as a first point of reference for determining the legitimacy of autograph memorabilia, but is not a substitute for having your items authenticated by a well-respected professional autograph authentication company. Some of the trusted sources within the sports memorabilia market include the following companies: PSA, JSA, Steiner, Tristar and Mounted Memories. Click on any of the images below to view full size photos. The signature is relatively consistent in character make-up with a right-leaning signature. The letter "R" consists of two lines, the vertical line s short and parallel to the adjacent line on the right; The curve of the letter starts well behind the first vertical line and comes almost to a point before beginning the down stroke. The rest of the signature consists of what can be described as two numeral "7"s; the first is about a third smaller than the second. These characters are crossed by a horizontal line on a 30-degree angle that starts at the end of the letter "R" and extends well past the second "7." The line often bisects the inscription " '52 " Lewis' jersey number. Ray Lewis Hot! signed Baltimore Ravens 11x14 photo PSA DNA cert PROOF! !